Portrait session (family/ maternity) £50 1-2 hours sitting fee payable at time of booking. A pre shoot consultation, usually done online or over the phone. An in person viewing of your gallery with chance to discuss any additional editing, layouts for products, and to see finished items in person. 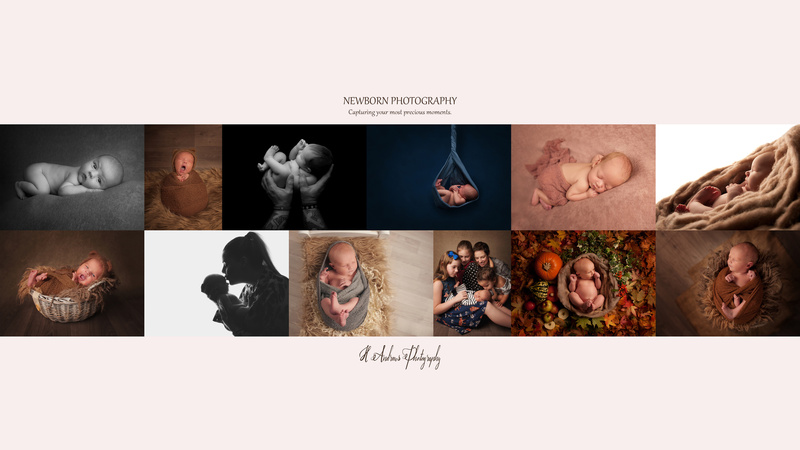 In addition for newborn photo shoots and as an optional extra for maternity portraits floral accessories may be provided, this will be discussed in your pre-shoot consultation. A normal session produces around 25 different images to choose from and often where I feel a sitting particularly suits it a range of black and whites as well, some images are omitted from the final galley as they are considered light tests, duplicates, or do not meet my professional standard. I am able to travel further please contact me for quotes. Delivery of orders usually takes around 3-4 weeksfrom the order date, so please do book well in advance. *New* for 2018 Acrylic orbs. High gloss shine and beautiful depth of colour and tones. These come with everything you need to hang them including the wall pieces for mounting and protective cushioning on the back. Sizes are in inches and these are gorgeous circular acrylics. Framed prints with a choice of eight different wide molding frames. Your image will be carefully mounted on acid free card backing sealed in to the frame and prepared for hanging. To add a mount to the outside of any of the print (increasing frame size) is an additional £20. These can include multiple images within the frame mounted or as a single print. The most popular canvas sizes are listed below, however I can provide a much broader range of size options on request, so please do ask if you have something specific you need. All canvas prints now come with a beautiful thick 38mm frame depth and varnish protection in a matt finish - this ensures your canvas colours more vibrant and contrasting, as well as providing extra levels of protection from sticky fingers, moisture, liquids and UV light. High resolution retouched images suitable for larger prints including copyright release for personal use including printing. Digital image purchases are non refundable as once you have downloaded the image files they can be copied and redistributed this is not a tangible product that can be returned. They will be made available for direct download from the website at the earliest opportunity once the order has been completed and any additional editing has been finalised. Your full gallery of digital images in both colour and black and white, a beautiful slideshow set to music. And a boxed set of 7x5 prints of all the images from your session in a mix of colour and black and white. Digital image sales provide print release to the client to print their photos freely and share with family, they do not include commercial use rights these must be purchased seperately, the original copyright remains that of the photographer. I Do back up your digital image files as I can not guarentee long term storage of your photos. I can not be held responsible for quality or colour of prints where I am not the print provider.